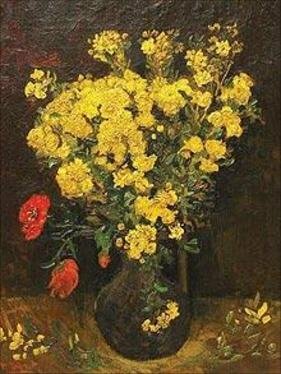 A week ago today the 1887 work Poppy Flowers, by Vincent van Gogh was stolen from a Cairo museum. Hadeel Al-Shalchi has a very good piece reporting on the security (or lack of it) at the Mahmoud Khalil museum in a piece for the AP which you can read on MSNBC. I’m quoted at the end of the piece, noting that the best way to protect works of art is not necessarily with an elaborate electronic security system. Those alarms and sensors certainly play an important role, but for a nation like Egypt, an active, engaged security guard who isn’t dozing off as these guards perhaps were, would seemingly have been a successful deterrent for the thieves. They apparently walked in and cut the work from the frame during hours the museum was open. And I want to make clear that when I was quoted in the piece saying “It’s not an exciting job, but you need to take it seriously”, I mean that security staff at museums are professionals, and should be given that status. In Cairo, these guards were certainly not expected or required to maintain an adequate standard, and the theft and damage of this artwork is the unfortunate result. But hopefully Egypt will learn from this crime, and enact some sound security procedures to ensure more works of art are not stolen in the future. Also of interest will be the arguments against repatriation of other classes of objects—such as the bust of Nefertiti—on the grounds that Egypt is not going to be able to adequately care for the object when it is returned. yet Art theft occurs in every nation, and bad security is bad security whether the museum is in Egypt, Europe, or North America. Thieves will exploit obvious gaps in security. As Mark Durney, current moderator of the Museum Security Network, asked this week “Why are some national collections not as well protected as others? Who, in addition to the thief, is responsible for the theft?” I think that is the right set of questions to ask, yet they need to be asked whenever a museum is unprepared for a theft, whether that museum is in Egypt, or France—where the security system at the Modern Museum may have not been in working order earlier this summer when five works were stolen. Hadeel Al-Shalchi, Security problems abound in Egypt’s museums, Associated Press, http://www.msnbc.msn.com/id/38884911/ns/technology_and_science-science/ (last visited Aug 28, 2010).